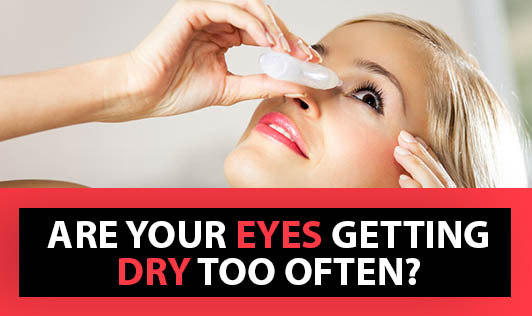 Are Your Eyes Getting Dry Too Often? People working on their computers for long hours or people riding bikes without any protection to their eyes often face this problem. There are many more reasons for dry eye syndrome. The symptoms which you should look for are dryness, itching, burning sensation, redness, a feeling of having a foreign body in the eye all the time, tired eyes, sensitivity to light, difficulty in wearing contact lenses, etc. The causes can include prolonged computer use, improper eye protection while riding two wheelers, prolonged exposure to air conditioners, menopause, side effect of certain medications including antidepressants and birth control pills, using contact lenses for very long hours, tear gland damage, aging, etc. Make sure to visit a doctor if you experience any of the above mentioned symptoms. There are many types of treatments available for this.